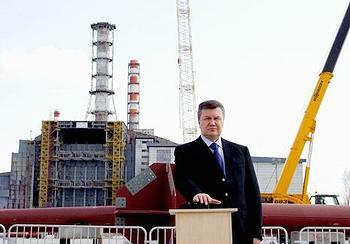 CHERNOBYL NUCLEAR POWER PLANT, Ukraine, April 26, 2012 (ENS) – Ukraine’s President Viktor Yanukovych today launched construction of the New Shelter Confinement that will be placed over the damaged Chernobyl nuclear power plant. The construction launch was timed to mark the 26th anniversary of the explosion and fire in Chernobyl Unit 4 that resulted in the world’s worst nuclear power plant accident. To date only a red commemorative arch has been completed in addition to a temporary shelter hastily built under hazardous conditions immediately after the accident. “We are witnesses to a historic event in the transformation of the Object Shelter into an ecologically safe system: the construction of the arch of the Chernobyl nuclear power plant,” said President Yanukovych. The one billion euro New Shelter Confinement is intended to prevent the Chernobyl complex from leaking any more radioactive material into the environment. 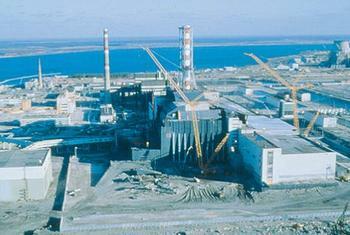 The nuclear power plant site is to be cleared by 2065 under a Ukrainian law passed in 2010. Originally planned for completion by 2005, under the current schedule, assembly of the New Safe Confinement will be completed in summer 2015. Then the new structure will be slid over the present steel and concrete structure. “This project’s successful implementation will ensure that the surrounding area becomes environmentally safe and that there are no radiation leaks into the atmosphere,” said the President. The structure is known as a “confinement” rather than the traditional “containment” to emphasize the difference between the containment of radioactive gases that is the function of most reactor containment buildings, and the confinement of solid radioactive waste that is the primary purpose of the New Safe Confinement. President Yanukovych emphasized that the project is unprecedented. “A lot of hope is pinned on the professional team that works at the construction site, which includes representatives of the Chernobyl Nuclear Power Plant, Project Management Unit western consultants, and the NOVARKA joint venture,” he said. The NOVARKA joint venture is formed by the construction companies VINCI Construction Grands Projets and Bouygues Travaux Publics. The Project Management Unit, an integrated team composed of dedicated Chernobyl Nuclear Power Plant staff and experts from the consortium of Bechtel and Battelle Memorial Institute, have confirmed that the 2015 time schedule is achievable. UN Secretary-General Ban Ki-moon today called on the international donor community to generously support Chernobyl-affected regions as they continue their efforts towards recovery and normalcy. 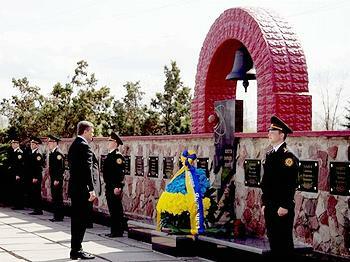 “On this occasion, we remember the hundreds of emergency workers who risked their lives in responding to the accident; the more than 330,000 people who were evacuated from surrounding areas with little hope of return; the thousands of children who later contracted thyroid cancer; and the six million people still living in the affected areas of Belarus, the Russian Federation and Ukraine,” Ban said a statement issued by a spokesperson. Ban said the United Nations is fully committed to the Decade of Recovery and Sustainable Development, proclaimed by the General Assembly for 2006-2016, and to the UN Action Plan on Chernobyl, which contains a declaration of principles embraced by all UN agencies involved in recovery efforts. The Action Plan emphasizes social and economic development and the promotion of healthy lifestyles and community self-reliance. “In the remaining years of the decade, the focus will be on helping the targeted communities adapt to the conditions in which they are living,” Ban said. He said that the urgency of strengthening the global nuclear safety regime is underscored by the nuclear accident at the Fukushima Daiichi nuclear power plant in Japan that was touched off by the earthquake and tsumani of March 11, 2011.